We are going to continue work on our Information Manager. This assignment will be mostly a skill building exercise. I hope to tie this assignment and the previous assignment together next week. Create a server side method that will retrieve the records, place them in an array from the database and send them to the client. Passing a parameter from the client (the web broswer) to the server is a bit tricky. As a result, in this assignment, I just want you to return an array of all 250 records. Later, we can learn how to ask for one of the records. You should, however, provide an interface that lets the user ask for any one record from the array of 250 that were returned. In particular, you should display the first record from the array when it is returned, then allow the user to enter a number between 1 and 250, and retrieve one of the associated records. You need not do any range checking at this point. I won't care if the app creates an error if the user enters a number like -15 or 266.
a place to show the selected record retrieved from the server. This would probably be a series of paragraph tags, but other options will be accepted. An input element where the user can enter the number of the item they want to retreive. A button to press to activate the retrieval of the next item. You will need to retrieve the array only once. This should occur immediately after your application loads. Once the array is on the client side, the user will be able to select any one item from the array. 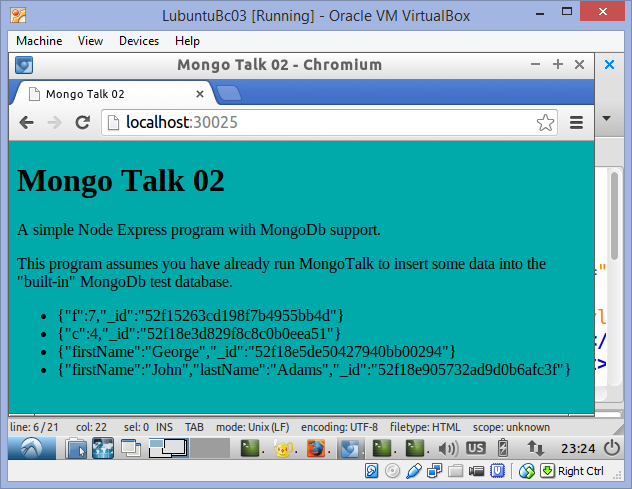 If you have not already done so, you need to run MongoTalk before you run MongoTalk02 so that at least some data will be in MongoDb. In the screenshot shown above, you can see that MongoTalk02 retrieves the data that I created with MongoTalk during our class on Tuesday, Feb 04. The data you created will likely be different. For this assignment, you will want to create a new collection and new data, as explained below. The screenshot shown below is probably not exactly the interface for the program you want to turn in. However, it might be helpful to look at it for a second. The display of one record, including: firstName, lastName, address, etc. The input box (type="number") for entering the number of the record you want to view. The button to click to show the record. Finally, notice the array of five records displayed at the bottom of the screen. This is not part of the assignment. In this case, I just deleted all existing records from the collection and added only five new ones. I had my program display these five records using a technique illustrated in MongoTalk02. My goal was to provide a screen shot for you that illustrats key elements of the interface I want to see in your assignment. It also provides a few tips as to what is happening behind the scenes. In particular, it shows the loaded data looks like as it sits in memory. Or you could check to see if the database is populated, and if not, to populate it. Or we could add a button to our client to populate the database. For now, though, the two script idea is probably simplest. Write to a collection called test_data. Do not write to the test_insert collection used in MongoTalk and MongoTalk02. Your data should look like sample address book data, with firstName, lastName, address, city, state and zip fields. And so on up to Rita10250. Remember, you should auto-generate these records in some kind of loop. This should be enough to get you started. More information coming soon. You should submit your work by checking it into Git in a directory called Week05-NodeExpressMongo.